Last week the big topic of discussion around the blogosphere was that most bloggers are not endorsing candidates yet. While probably coincidence, maybe that gave a push to some bloggers to be contrary and start taking sides. I’ve noticed two recent endorsements around the blogosphere, one of which I agree with. Steve Soto has endorsed Hillary Clinton, primarily stressing her abilities as a campaigner, as opposed to her views. While I disagree in supporting Clinton, I must repeat what I’ve already conceded that she has done the best job in the debates, and she will be difficult to beat. While Clinton still needs to do a lot more to sell me on supporting her, over the course of the campaign my position has shifted from being able to perhaps consider anyone but Clinton to anyone but Edwards. (If they had a ghost of a chance of winning the nomination I’d also throw Gravel and Kucinich into this category.) Clinton also received a major non-blogosphere endorsement from Diane Feinstein, who I’ve had little respect for after her support for Bush’s disastrous Medicare D program. At the moment I’m looking far more at the views of the candidates than questions of electability, allowing the campaign to play out to separate those who are electable. If I were to look at electability, Richardson would appear weaker compared to Clinton and Obama at the present, but looking at his stump speech in New Hampshire gives me hope that this could change. Edwards would be a disaster for the party, and fortunately has fallen behind Richardson in New Hampshire. Just as Obama would help bring in more professionals, Edwards, with the exception of trial lawyers, would drive away large numbers of former “Starbucks Republicans” who are starting to vote Democratic. If Richardson remains far behind Clinton and Obama, the race very well could remain a contest between these two. The battle between them heated up this week and Obama now looks like the big winner of that scuffle. Obama has reduced Clinton to having to argue that she is not a “Bush/Cheney light” and has helped to reduce any advantage she might have had on foreign policy. Of course if things continue to go poorly in Iraq, Obama’s judgement will trump Hillary’s experience and he could very well beat her in both Iowa and New Hampshire. I’ve often said that the bulk of the people on the Republican side are not the Republicans we grew up with, and perhaps even agreed with from time to time. The sane people have been driven out of the party, and the current conservative movement is dominated by the extremists who would have been with the Birchers, or perhaps the Klan, in the past. I have trouble with someone like Ron Paul who does not even believe in the separation of church and state hiding behind the Constitution, and the Birchers were far better known for their paranoia than their support of the Constitution. Ron Paul’s connections to the Birchers might be overlooked as not being representative of other conservatives, but now Think Progress has posted a clip of Glenn Beck of CNN. Beck says he used to think the Society members were “a bunch of nuts,” but that they are now “starting to make more and more sense” to him. I find it hard to believe that CNN still has a reputation for being a liberal network when they air conservatives from Wolf Blitzer to Glenn Beck but perhaps having Glenn Beck on does serve a purpose. Let the conservatives talk enough and we can see how they really think. From a pragmatic viewpoint, impeachment might make little sense. Even if impeached, it is unlikely that Bush would be removed from office, and there is much not time left on his term. However, every time the Bush administration ignores the rule of law, it is harder to keep from thinking that the founding fathers would see impeachment as the only response to a rogue President who violates the principles they stood for and upon which this nation was founded. It is difficult to imagine a reason for providing Congress the power to impeach if it does not apply to George Bush. Though other events in recent months and years have had graver consequences in themselves, I’m not sure I’ve seen a more open, casual or brazen display of the attitude that the body of rules which our whole system is built on just don’t apply to this White House. Impeachment is not about hatred of George Bush as Republicans would claim. It is about who we are as a nation, and about defending the system of democracy established by the founding fathers. Gerald Ford did the nation a great injustice when he spared Richard Nixon from prosecution for his crimes. Seeing Richard Nixon ignore the principles of democracy made the actions of the Bush administration more likely, which sets a dangerous precedent for future tyrants. If we care about our democratic form of government there is no longer any excuse for Congress to ignore its Constitutional obligations to hold George Bush and his administration accountable for their disregard for democracy and the rule of law, as well as the damage they have done to this nation. 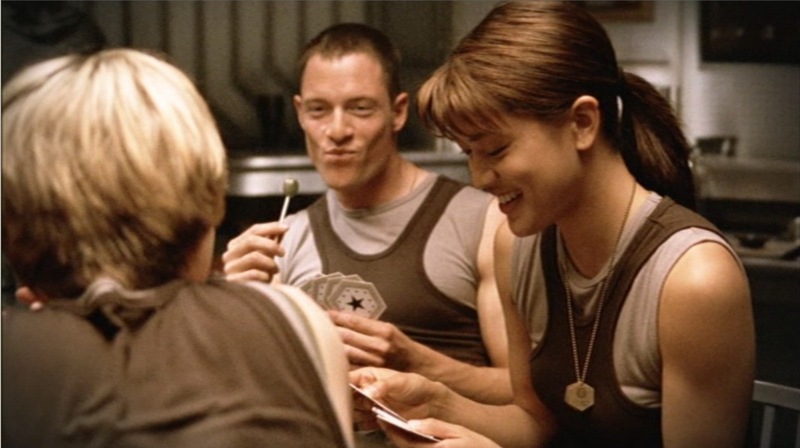 Reading this story put a picture in my mind of Kara Thrace playing cards against a group of Cylons and winning. In real life, humans narrowly beat the computer in a poker match. Scientists had billed the competition as a milestone for computer artificial intelligence, similar to the 1997 match in which a computer named Deep Blue beat Russian genius Garry Kimovich Kasparov at chess. Poker is a special challenge for computers — which can already consistently beat humans at chess, checkers and backgammon — because the gambling game includes deliberate deception, unpredictable emotions of opponents and elements of chance as well as mathematics. It’s good to see that there’s still one game in which we can beat machines–for now. I only bring this up because it’s been in the back of my head for a while that he’s right. I’ve always been vaguely in favor of refusing to give up the “liberal” label because I don’t think we ought to let Republicans decide what we can and can’t call ourselves, but over the past year or so I’ve been slowly coming to the conclusion that not many people agree with me about that. I’m a fairly hardnosed descriptivist in vocabulary matters, and it’s starting to look like “progressive” has won this battle whether I like it or not. There are many excellent comments following his post. Some of the reasons given both for and against the term liberal suggest reasons why I used the term in the name of the blog. Among the aspects of liberalism which I considered in naming the blog were its origins in support of freedom, as well as stressing social issues. On economic issues liberalism leaves a certain degree of ambiguity if the original meanings from classical liberalism as well as European liberalism are considered, but for my purposes that is something positive. While I discuss economic issues far less than social issues here, Liberal Values is firmly a supporter of the free market. However I also contrast this with the corporate collusion of the Republicans which is a perversion of capitalism. Such support of a free market economy is, at very least, consistent with the original and the European definitions of liberalism. It is also an accurate description of many modern American liberals. In recent years, liberalism versus conservativism has become increasingly divided by social issues, and more recently by one’s opinion on Iraq. Economic issues have become much less a factor, despite the attacks by the right wing noise machine on those they claim are socialists or tax and spend liberals. While Republicans have strived to make liberal a dirty word, I would not let this dissuade me from using it. Changing to progressive in place of liberal will only embolden conservatives in their belief that they can redefine reality as they choose, and they will do the same to progressive and any other word which is used. Besides, I far prefer liberal, with its roots in supporting liberty, than progressive. If conservatives have made liberal a dirty word, it is time to point out the invalidity of the source. Those who made liberal a dirty word are the same people who claim evolution is false, and that Iraq had WMD justifying the war. These even include the dwindling group of people who approve of the job performance of George Bush. The right wing noise machine may have succeeded in demonizing liberals in the past, but this is an excellent time to go on the offensive and show the dishonesty of the conservative attackers, as opposed to retreating as Hillary Clinton has.